CONTACT US. Send an email and include your Name, Email Address, City and State and Phone Number. Be certain to explain the reason for contacting us. We will contact you within a few days. Thank You. IS THAT A “KEEP AWAY” GROWL ON OUR PORCUPINES FACE – OR A GRIN? ONCE YOU PAN OUT THIS PAYDIRT YOU WILL GROWL “KEEP AWAY” AND GRIN! *SEND US A NOTE AND TELL US HOW MUCH GOLD YOU PANNED FROM YOUR PAYDIRT AND YOU GET YOUR FREE PASS*. Use the “Contact us” link and give us the information requested. WE ADD GOLD - PLUS you get the GOLD that was already in our UNPROCESSED PAYDIRT. We will put your names on 1 lb. 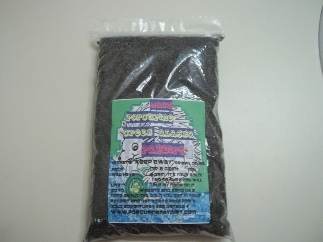 Bags of our PAYDIRT for your Gold Panning Party, Holidays or Special Occasions. Use Add to Cart. 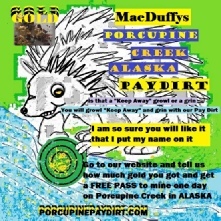 2 1/2 pound Creek Bottom Porcupine Creek PAYDIRT Gold guaranteed! ADVENTURES: Daily & Weekly Gold Adventures on Porcupine Creek starting 2016. You may fly, drive, bike, hike, RV, truck or bus to Duffy’s on the Main Highway in Alaska - we have a runway. You may hike in, bring an ATV or we will take you back the 5 miles to our claims by ATV or - rent an ATV - Gold Panning at Duffy’s - Off Road Tours - Airstrip with flightseeing, hunting or fishing Adventures - RV Park - Cabins - Auto Service - Towing - Café - Fuel - a Store & More – We are shown on all Road Maps and Aeronautical Charts - Gold Adventures: June thru September.